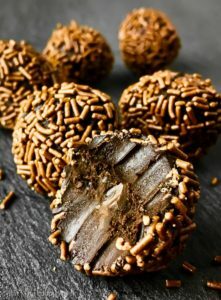 A wonderfully simple recipe for wonderfully chocolate-y melt-in-the-mouth taste explosions known as raw vegan chocolate truffles. As an added bonus, these lovelies are also gluten- and refined sugar-free. Their a-h-mazing looks have nothing on the finger-lickingly delicious taste. 1. Melt coconut oil in a pot on low heat, then transfer it to a bowl. 3 Add cocoa powder and whisk thoroughly. 5 Cover the bowl with cling film and put into the freezer for about 30 minutes or until the chocolate mixture sets solid. 7 Spoon about 1 tbsp of the chocolate mixture and form it into a round truffle with your hands. 8 Roll each truffle in the desired topping. Note 1: If you or your vegan friends are on the honey-is-not-vegan side, use maple or agave syrup. Note 2: These are suggestions if you don’t want just “plain old” chocolate truffles. Not that chocolate could ever be plain. But to spice things up, play around with flavors – the possibilities are pretty much endless! Note 3: The chocolate mixture will at this stage look as though it has split. It’s supposed to look that way – no cause for concern! Thanks to : https://theloopywhisk.com/2016/12/26/raw-vegan-chocolate-truffles/Recipe by The Loopy Whisk (www.theloopywhisk.com).